A recent article in the London Review of Books talking about the connection between writing and map-making was a timely read for me as I was on the verge of launching Mike Lendingham’s third book - ‘They Don’t Just Fade Away’. Mike first two books were short stories based on his experiences in army and civvy life. A former New Zealand Special Air Service (SAS) and NZ Army infantry soldier, Mike’s short stories were often strongly worded and always to the point. Along with a good dose of humour, ‘Once a Grunt’ and ‘Always a Grunt’ also contained a sustained level of anger (and swearing). One story in ‘Always a Grunt’ about a young boy’s abuse by a Catholic priest was particularly sharply felt and worded accordingly. The stories are highly readable, however, and entertaining, with a genuine appeal for anybody who has made the transition from the military, or even corporate life to the “normal” civilian world. ‘They Don’t Just Fade Away’ is Mike’s first novel and as such required a different approach to maintain the story through the full length of its 70,000 words. While preparing for the launch of this new book in the South Wairarapa town of Featherston, I read an article which compared writing to track or map-making through various historical references. Maps carried refences to the past of the places they tracked and reading them could fire not only memories but also the imagination of the expectant visitor. The comparison was particularly apt in the case of writing by an ex-soldier like Mike, who had not only tracked through the bush in New Zealand and South East Asia but also through a life filled with the challenges, the highs and lows, the anger and humour that ultimately come with broad experience of humankind. ‘They Don’t Just Fade Away’ tracks the story of Bill Secombe, a former soldier whose world falls apart after the love of his life dies. Bill heads up to the Northland area of New Zealand, where he builds a successful business in the hope of getting on with his life. He remarries but, after a bad accident, his new wife and her family figure out they are better off with him in an old people’s home and them in control of his now-substantial bank accounts. Bill manages to give them the slip but only after having a nasty tangle with a bullying male staff member. In the time-honoured fashion, he hits the road and goes south, ending up in the West Coast bushland with Frank, an aging, sick but determined old mate. A kind of “Wilderpeople for pensioners” ensues. With Bill not aware he has been cleared of any charges, they go bush. As they get deeper into the bush, they also become more deeply immersed in each other's stories. Frank gets sick and Bill must use all his personal and physical resources to save him, all the while believing he is a wanted man. 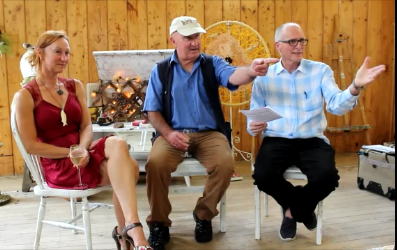 The book’s launch took place at two venues in Featherston. 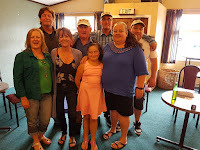 One was at the Featherston Returned Services Association base, where an over-seventies group was having a get together in the bar next door. Close friends and family from the southern North Island gathered in the gloom and caught up with Mike, talking one-on-one with him. It was kind of the Featherston RSA to assist with a book launch. It was very much appreciated. 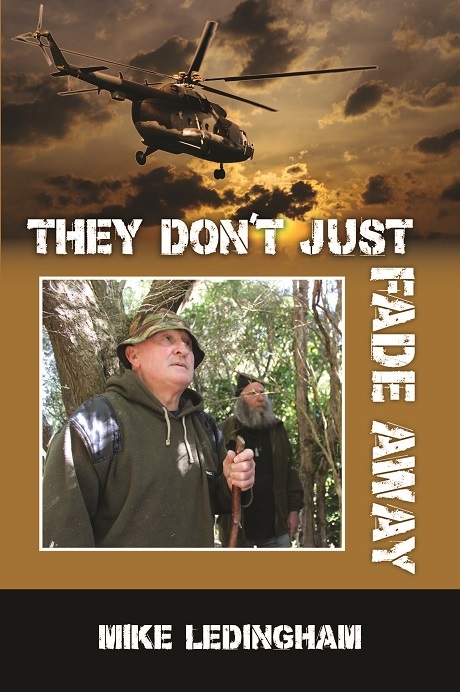 Given the title of Mike's book "They Don't Just Fade Away" it reminded us that organisations like local RSAs and community facilities should be treasured. The second event was held at Fareham House, and was run by Justine Kingdon, one of Mike’s nieces. This was more of a “meet the author” opportunity, with Justine interviewing Mike and me about writing, publishing and our collaboration. Fareham House had had a noteworthy past, starting out as the grand home of one of the Wairarapa’s pioneering families before being a government-run facility for girls who were wards of the state. Today, Fareham House has taken on a new life as a venue. writing in a new direction. I was reminded how, like map-making and writing, houses (homes) have a life of their own. During our discussion, I talked about how the map-making analogy was appropriate thought Mike's case given the trails he takes readers along in "They Don't Just Fade Away" while using words and ideas as markers to help readers better understand his story. “Like a map-maker, Mike takes readers up north to small town life, into a northern Maori community, then drives us to the majestic West Coast bushland. And at the same time, we are taken on a journey through the map of life today for ageing soldiers - indeed many elderly people. We see the sign posts of unseen bullying and the struggle for self-belief and survival in what, to many, has become a confusing world where maps have given way to impersonal digital recognition devices. We talked about the language in the book and how Mike was coming to terms with the need, ultimately, to communicate in more nuanced ways.